Lost a close one today, but close doesn't matter. 1. Identify the American Neo-expressionist artist and filmmaker responsible for this work. Getting this one right felt pretty great because it took me a few hours to get there. Contrast yesterday, when I might have remembered ammonia (whose chemical formula, NH3, I knew was the right answer) if I hadn't immediately thrown in the towel and made a guess I knew was wrong. Today I kept thinking about it and played later in the day, which made all the difference. When I first read the question, I thought of the name Renoir, as in the filmmaker Jean Renoir whose father was the well-known painter. But the answer had to be an artist and filmmaker, same person, and it had to be an American. Next I started thinking about people who make films as expressions of art, not necessarily narrative films, people like Pipilotti Rist whose work I have seen as installations in art museums. But she for one is not American, and I don't know if she creates any art other than films. The answer felt like it had to be a visual artist who also makes films, and it seemed to me that the films should be well enough known that the person can be legitimately labeled a filmmaker in addition to an artist. By that measure the best-known example has to be Andy Warhol, who though he never lit up a box office was certainly an active and prolific filmmaker. But he's dead, I thought the question was probably asking for a living person, and even if not the artwork didn't look too Warholian to me. As for prominent American artists like Eric Fischl, Chuck Close, Cindy Sherman and Jeff Koons, I didn't know any of them to be a filmmaker, or for that matter a Neo-expressionist, and the artwork didn't particularly look like any of their work either. 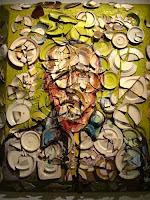 The most commercially successful filmmaker among visual artists, in that his films have been widely distributed to movie theaters, is the artist Julian Schnabel. I couldn't tell you the first thing about his art, which could be why the image in question did not look familiar, but I did know he directed the movies Before Night Falls and The Diving Bell and the Butterfly. I remember when the latter was released a few years ago, how cool I thought it was that a famous visual artist was working the film festival and award show circuit promoting his movie. It just took me a few hours to think of the guy, which is why it felt so good to finally come up with a guess I didn't know was right but I did know was at least respectable. The point of all this, beyond that I type fast, is that it's worth setting aside and coming back to a tough but gettable question later in the day if you don't immediately think of a decent guess. You have a roughly 24-hour window in which to play. If you're impatient, like I was yesterday, you might cost yourself a right answer, and possibly a win or a tie. It's like when you go down 5-2 in a tennis set or in the late innings of a baseball game. If you give up you've beaten yourself, but if you dig in and keep trying, you might surprise yourself. 2. In modern usage, the term bulge bracket refers to a group of investment banks considered the world's largest and most profitable. During the financial crisis of 2008, three bulge bracket members ceased to exist as independent entities -- name any two of the three. I've read fairly extensively about the financial crisis, not only because I find it highly interesting but because I deal with the real estate mortgage world at work, and I've already marked my calendar to hear Michael Lewis speak at a dinner in June. I also recently saw the HBO movie Too Big To Fail. My feeling on this question wasn't, I hope I get it, but rather, I will feel like a complete idiot if I somehow find a way to blow it. I knew for sure that Lehman Brothers and Bear Stearns had not survived the 2008 meltdown. I also knew that Merrill Lynch (...Pierce Fenner and Smith) had been forced to sell itself to Bank of America and CEO Ken Lewis. The problem was that, with so many big banks in play, I couldn't swear to which ones were technically investment banks as opposed to commercial banks. I was pretty sure Bear and Lehman had been I-banks, but I didn't want to screw up this question on that issue. I also couldn't remember for sure whether Morgan Stanley, like Merrill, had been made to accept a cash infusion from an outside company and give up control of its own fate. If so then maybe it was one of the three companies in question. I started to second-guess my feelings about Merrill. Given its enormous Main Street retail presence, maybe it had been set up as a brokerage house and not an investment bank. I knew it wasn't a commercial bank but maybe it also wasn't an I-bank so its loss of autonomy wasn't the one I thought the question was going for. Ultimately I went with Bear and Lehman because I knew for a fact they had both melted down in 2008, I felt fairly confident they'd both been investment banks, and the question was only asking for two such banks. Merrill did indeed turn out to be the third company in question. 3. In 1994, three films were released starring Jim Carrey which became box office hits: Ace Ventura: Pet Detective, Dumb and Dumber, and what other film, which was also Cameron Diaz's feature film debut? Total gimme. A mask turned Jim Carrey from a nudnik into a zoot-suited superhero and The Mask turned Cameron Diaz from a model into a movie star. 4. What is the term in geometry, Latin for arrow, which is defined as line segment drawn perpendicular to a chord in a circle, between the midpoint of the chord and the circle's arc? This one was frustrating because I did know what a chord was in geometry, but that did absolutely nothing for me. I guessed vector, even though that is a physics term, but because vectors are generally indicated on paper by arrows and I didn't have a better guess. The answer was sagitta. Sa-what-a? I'm guessing sagitta ties in to Sagittarius, but that's not one of the zodiac symbols I know something about, and in any event I've never heard of a sagitta. Major props for anyone who used the zodiac to get this one. 5. This is a promotional photo of the cast of what television series? Watching it, loving it. Smash. The pilot was terrific, episodes 2 and 3 also very good. Haven't seen the new one yet. In case you somehow missed all the hype, including during the Super Bowl, Smash recounts the high-stakes process of creating a new Broadway musical about Marilyn Monroe. Steven Spielberg is the executive producer, there's a star-studded cast, and the creative team is a theater Who's Who: the director of the pilot directed Spring Awakening and American Idiot; the primary writer penned a number of Broadway hits including the current Seminar with Alan Rickman; the songwriters wrote the music for Hairspray and the South Park movie; etc. You can catch up on the NBC website. Check it out. 6. The five permanent members of the United Nations Security Council are also the five countries recognized as nuclear-weapon states under the 1970 Nuclear Non-Proliferation Treaty. Russia and the United States are two; name the other three. Argh! Thinking of the ongoing tensions between India and Pakistan, I went France, UK, India. I forgot that as populous as India is, China is bigger, richer and more militaristic. At least I didn't say Israel, which I actually thought about doing. Still, feel like I should have gotten this one. Had I listened to my own advice about not rushing into a dumb answer, I would have had a better chance. I didn't spend enough time thinking about this question. It was way gettable. My opponent today was the estimable Dan Feyer, two-time defending champion of the American Crossword Puzzle Tournament and plenty tough in the trivia world as well. Dan is strong across the various categories of questions in the league so it wasn't clear how I should play defense. Likewise, I gave Dan a 1 for the Bear Stearns question, the other one he missed. I figured that, especially as a New Yorker, he'd know this widely covered story well enough to get this question even if he didn't particularly take an interest in the financial world (I had no idea whether he did or not). Wrong again. I gave Dan a 2 for the nuclear weapon question, which although probably more widely known, I deemed tougher because we had to get all three countries. With the Wall Street question we only had to name two of three. I was so pleased with thinking of Julian Schnabel that I gave Dan the 3 on that one. But the guy lives in New York City, makes his living in the arts, and his stats show strength across the creative world. To his credit, he joined me among the 15% of players leaguewide who nailed the Schnabel question. Dan and I each managed 4 correct answers out of 6 but he beat me by a point thanks to his superior defense and ended my undefeated start to the season. Had I played perfect defense, I would have won by a point. Had I not choked on China vs. India, I would have tied. But in the real world, I lost a close match to a worthy opponent. Nice one, Dan! Yeah, I do not take an interest in the financial world, though I do keep up on current events. I really did not know that Bear and Merrill both didn't survive - and I got confused by the "ceased to exist as independent entities" language - so my guesses were Lehman and AIG. I probably should have known, just from following this here blog, that this is in your professional wheelhouse, and not given you two points! * Though when I visited Chicago, I did enjoy the Art Institute, thanks mostly to Mr. Seurat. i think i would have gotten the UN question anyway, but i just finished the UN part of my International Information Systems course, so i was all over it. i messed up my points spread yesterday, though, and ended up losing. I'm a little surprised that the UN question was so difficult -- also based on the stats, not just here. I guess I am more immersed in foreign policy than I realized. The relevant year for the Security Council was not 1970 but 1945, as it was the de facto victors in World War II who got to divvy up the power. India in 1945 wasn't yet a sovereign nation free of colonial control at that time. I too guessed Lehman Bros. and AIG, as they were the only two 2008 finance entities I could possibly have summoned. Of course when I saw the answer, I recognized the names. I was similarly surprised that this question was so easy for so many. Instead of Schnabel I unwisely guessed Joseph Cornell. Something about the term neo-expressionist put me in the mind of the 1950s rather than post-1980, but that's my problem, not a fault of the question.